My friend Tony TEXLEY came across this old poster a while back and sent it to me as a gift. Lakeside Ballroom located in Glenwood, Minnesota was one of the hundreds of ballrooms that dotted The state of Minnesota in the 50s and 60s. This was a time where in the big bands were dying out and rock ‘n’ roll was the big new thing. The teen hops as they were called then ran on Tuesday nights and the other bands played mostly on the weekends. 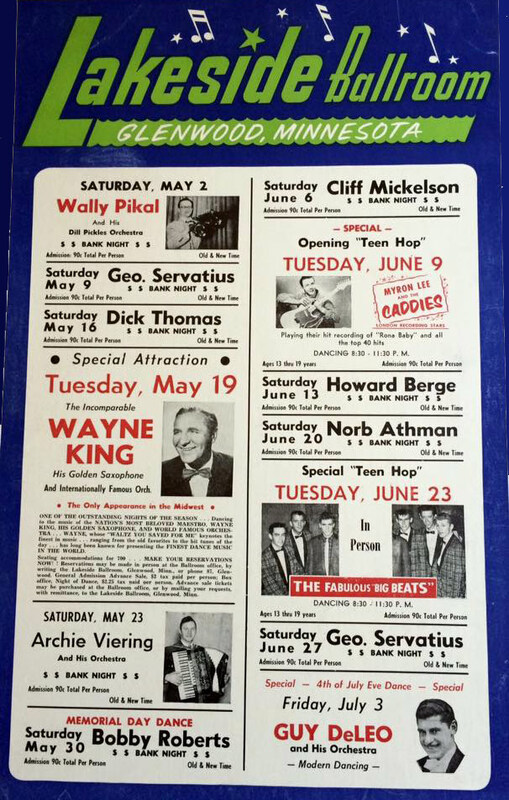 This is a 1959 poster and we played there every six weeks during the summers. Wayne King was a big name then and I think the Big Beats were a popular band from Minneapolis. We were very fortunate to have a great booking agent by the name of Jimmy Thomas and he booked us in many of the Minnesota ballrooms across the state.I was very fortunate to receive a Lifetime Achievement Award in the State of Minnesota a few years back when BOBBY VEE and DAVE DUDLEY we’re on the ( Rock-Country Hall Of Fame ) board along with others. It was a beautiful ballroom where people could dance and enjoy the music.I’m not sure if it still stands, most of them are gone.